First In Command. The Detachment Commander is responsible for ensuring and maintaining the operational readiness and all other aspects of the CAA-Team. He may command or advise all aspects of the CAA. He focuses on presenting the CAA to the outside world while still mining the overall operations of the team. He commands in the absence of the detachment commander; serves as technical and tactical authority in all aspects of Special Forces operations; supervises all staff activities; is the psychological operations (PSYOPs) and Civil Affairs authority; has cultural, regional, and linguistic abilities; manages the mid-term and long-term planning. He can recruit, organize, train, and supervise indigenous combat forces up to battalion size. He is responsible for overseeing all Team operations. He is usually the person who actually runs the Team's OPerations each month. He can recruit, organize, train, and supervise OPCOMs for CAA combat OPs. 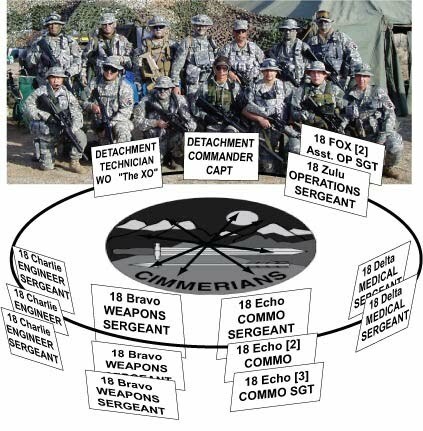 He coordinates op information between the OPCOM and 18Echo’s in commo. Operations Development Workspace - 18_Zulu and 18_Fox operations sergeants and all OpComs will do scheduling, planning, development and After Action Review of Cimmerian MilSim OPs in this space. Assists the Team Sergeant in operations planning for the Team. Plans, coordinates, and directs the Team's intelligence, collection, analysis, production and dissemination. He field interrogates and processes enemy prisoners of war and schmoozes local war lords. He briefs and debriefs friendly patrols. He Supports OPCOMS with Maps, Orders review and allo other phases of OP work-up. The "Commo Guy" - The lifeline. His responsibility is to establish and maintain communications. He employs the latest Web, Dboard, Emails and any other necessary commo devices to get the word out. The SF Commo sergeant is an invaluable and vital part of all CAA missions. The 18 Echo’s facilitate communications of Cimmerian Operations to the public and to focus and collect relevant information about the airsoft world for club use. This includes PR, Website, info gathering and info dissemination. 18echo works closely with XO and 18zulu to promote "POGOEM". 18Echos specialize in RF or Computer comms but all have a working knowledge of these systems. This Cimmerian is responsible for safety in all aspects from eyes and teeth to conventional first aid. They are responsible to survey CAA members to track those trained in first aid procedures and medical skills. They are responsible to check, maintain and stock the Cimm FIRST AID kit in the GO-BOX at every OP. At the OP, they present the Safety Briefing at OPs and are called on to organize first aid and evac if a casualty occurs. Theses are the combat engineers and demolitions experts. He can build as well as destroy almost any structure. The Cimm "Demo Man" is capable of constructing everything from an outhouse to a schoolhouse. They are creative and like building All manner of props and devices. 18Charlies are responsible for the GO-BOX and its contents. 18Charlies are responsible for the Cimm property and its storage location. 18Charlie works closely with 18Zulu and OPCOM to promote "POGOEM". Works in the 18C group. He is usually the OIC for the 18C group - The team finance OIC primary function is to account for revenue and record keeping support for all CAA_ functions. Approve routine expenditures and make routine payments. The 18HOTEL coordinates with the 18ZULU and DC on financial matters. Annual corporate reporting and 501c3 requirements are covered by the 18HOTEL's. Quarterly admin telcon meetings are coordinated though efforts of the 18HOTEL MOS. The weapons experts. Capable of firing and employing nearly every small arm and crew served weapon in the airsoft world; such as pistols, rifles, machine guns, mortars, anti-tank guns, and grenade launchers. They endeavour to qualifiy in all Cimm skills areas. They assist any participants in the event of weapons issues - on or off the field. They will be called upon for an special weapons rolls in OP scenarios. These are the bread and butter members of the unit. At the OP the 18Bravos man the Chrono, take donations, and verify registration and waiver compliance. This is a big job and SOP is to have 2 18Bravo's at every OP to execute this task.